The Robert Packer Hospital, Sayre, Pennsylvania, was incorporated in 1885 and has a capacity of 325 beds. 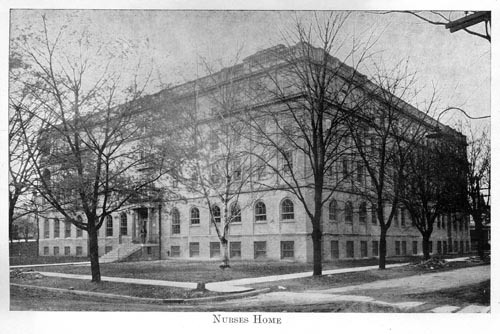 The School of Nursing in connection with the hospital was organized in 1901 and at present has a school of 100 Students. It is an accredited school and its graduates are qualified to take the State Board examinations for registration of nurses in Pennsylvania, also eligible for registration, by endorsement, in the State of New York. The school offers a three-year course of practical and theoretical instruction in Medical, Surgical, Pediatric, Orthopedic and Obstetrical Nursing and Dietetics. Classes are admitted once yearly, in September. Application for admission should be made to the Directress of Nurses by letter or in person. Following the filing of an application, arrangements should be made for a personal interview as this is necessary before application is accepted. A personal interview can be arranged by appointment, any day except Sunday, between the hours of 10:00 A. M. and 4:00 P. M.
Applicants must have had four years of High School study, with diploma, and 16 units or 72 counts. Only those students in the upper half of their class can be considered. English—four years; History—two years; Mathematics—one year; Science—two years (General Science, or Biology and Chemistry) and sufficient of the elective subjects to complete 16 units are required. One or two years of Latin are helpful. All educational credentials must be submitted to the Department of Public Instruction at Harrisburg, Pennsylvania, for approval, before any application can be accepted. The passing grade of examinations in the school is 75% and all students must meet this requirement during the entire course, to retain their place in the school. All applicants are required to take the aptitude or intelligence test which is given by a Psychologist, recommended by the Pennsylvania State Board of Nurse Examiners. The fee for this test is five dollars ($5.00) and it is conducted at the hospital. Applicants must be between the ages of nineteen and thirty-five years of age and unmarried. Applicants who have had training in other schools of nursing are not usually given favorable consideration. Applicants should possess good health and have no physical defects. Any defective conditions of eyes, throat or teeth must be remedied before entrance to the school. A thorough physical examination will be conducted at the hospital, by a staff physician, before acceptance of an applicant. A statement from the family physician and dentist is required, also a certificate of Small pox vaccination within two years previous to admission. Careful attention is paid to the health of the students. Monthly weight records are kept for each student, at least one annual physical examination is given and other examinations when considered necessary. During illness all students are cared for gratuitously but time so lost must be made up at the end of the course. In case of serious illness, members of the student’s families are notified and advice given regarding their progress. This school is non-sectarian, but each student is encouraged to attend the religious service she desires, for which ample opportunity is afforded. During the first four months the student has a program consisting largely of class work. During the first two months she has only a class program. At the beginning of the third month she is on duty four hours daily in the wards of the hospital. During the preliminary period the student has a half-day off duty on Saturday and all day on Sunday for the first two months; during the third and fourth months the student is off duty a half-day on Saturday and a half-day on Sunday. On the completion of the preliminary course the student is given two hours off duty daily, a half-day during the week, and four hours on Sunday. All classes are held during the hours on duty. There are no evening classes. While on night duty the student is given two hours off duty each night, and at the completion of the term of night duty is given one day off for each month of night duty. The expense connected with the course varies with the individual habits and tastes of the student. No allowance is given at any time during the course. A deposit of $5.00 for breakage and a Registration fee of $60.00 is to be made by the student upon entrance to the school. If the student leaves the school during the first month, Thirty-five dollars of this will be refunded, but nothing after that time. Uniforms worn during the preliminary period are furnished by the students at a cost of from $20.00 to $25.00 for four dresses and twelve aprons. Upon the completion of the preliminary term the student is supplied with uniforms by the hospital for the remainder of the course. Shoes will be furnished by the student during entire course. Each student will be expected to purchase several books at a cost of approximately $15.00. 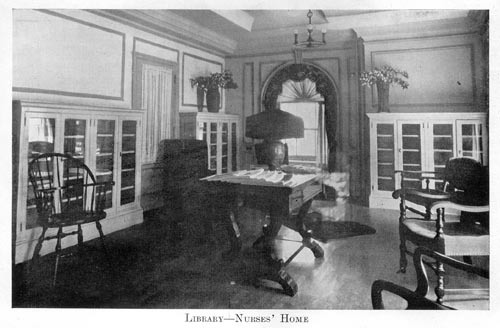 Other books as required are furnished by the hospital but remain permanently the property of the hospital. All students, however, have the privilege of buying the books at a discount from the cost price. A reference library of five hundred books is available for students in the class room suite. Board, room and laundry are furnished by the hospital during the entire three-year period. A vacation of three weeks is allowed during the first year, and two weeks each during the second and third years, making a total of forty-nine days during the course. Vacation season extends from June first to October first. Students are not expected to be away from the school at other times unless in case of illness or emergency. Upon admission to the school each student is given a copy of the Book of Rules governing the conduct of the nurse. Each student will be expected to conform to these rules in every detail, regarding the hours of rising and retiring, hours for meals, and the general routine of the hospital. A program of student activities is arranged for the social welfare of the student. This program includes dances, teas, informal parties, outdoor tennis, basketball, student chorus, dramatic club and the publication of year book, "The Nucleus." If the record of the student proves unsatisfactory during the Preliminary Period, her association with the hospital may be terminated. At any subsequent period, the Board of Directors, upon recommendation of the Training School Committee, may dismiss a student for failure to meet the scholastic, ethical or professional standards of the school. Students who marry during the course automatically forfeit their association with the school. It is not considered advisable to admit or retain married women in the school. Upon completion of their course, graduates are required to take examinations for "Registered Nurse" (R. N.) granted by the Pennsylvania State Board of Examiners for Registration of Nurses. 1. "Untitled", The Robert Packer Hospital, Training School for Nurses, Sayre, Pennsylvania, Undated, pages 2-9.